Sjef Kuijpers lives in the southern part of the Netherlands in the town of Veghel, province of North Brabant. He has been a customer at Autotess in Deventer for maintenance and repairs for his Saab 9-5. 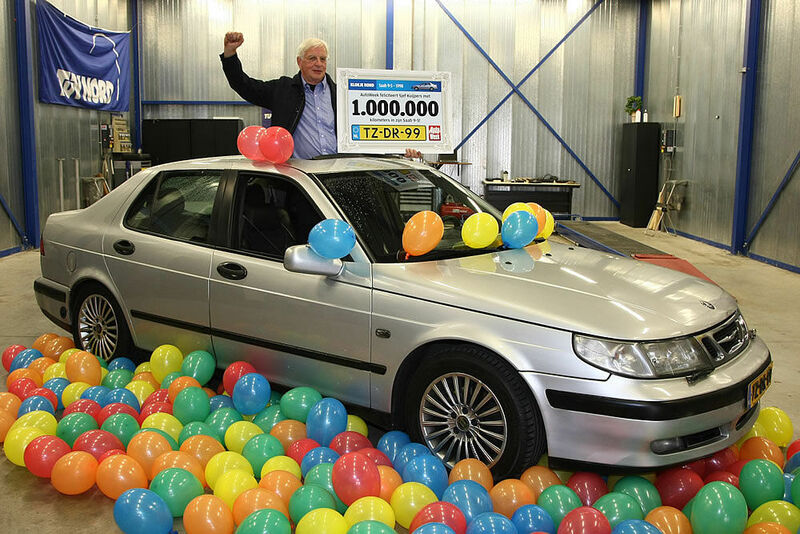 A few months ago, he parked his car at their business with exactly 1 million kilometres on the odometer. “That’s what I promised Gerrit Tessemaker of Autotess”, Sjef said. “I was 1 kilometer short so I had to drive a few blocks in the area. After that, I went to a local bakery and bought a cake which showed “Saab 1.000.000 km 24/04/2012”. This happened a few months ago and the car currently has done 1.016.000 kilometres. Sjef bought this Saab 9-5 when it had 329.000 kilometres on the odometer. “About 5 years ago, I had a few problems with the LPG equipment in the car. Local workshops could not fix the problem. Eventually I ended up at Car Service Ton Elzebroek in Deventer where Gerrit used to work as a mechanic. Gerrit quickly figured out there was a problem with a control unit. A day later, the part was replaced and the problem was fixed. I was very happy about that.” Reason enough for Sjef to return to the same garage every time the car needed maintenance. “Oil and filters were replaced every 10 to 15,000 kilometres. This was done about 6 to 7 times a year. I also stop by their garage for other regular maintenance and replacement of parts. You should be able to trust the garage that maintains your car and that trust is well earned by Autotess. Service and repairs are done when the car needs something but no unnecessary repairs are performed. Gerrit is a very nice guy and mechanic Ronald Kaboel is very knowledgeable about Saabs and even owns one himself”. Not many Saab owners will see 999.999 on their odometer. 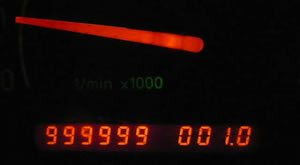 The odometer actually does not go past that number and return to 000.000, according to a post on the Dutch Saab forum. It just remains at 999.999. One million kilometres is equal to 621.371 miles. The owner drives about 100.000 kilometers every year. The engine was modified to use LPG (Liquefied Petroleum Gas, similar to propane), a common automotive fuel in the Netherlands. This story was originally published in 2012. A quick search for license plate TZ-DR-99 shows the last safety inspection expired in April 2014 so it doesn’t look like this Saab 9-5 is on the road or being driven anymore. A post on the Dutch Saab forum shows this 9-5 is now in the showroom at a Saab dealer in Lochem, Netherlands. 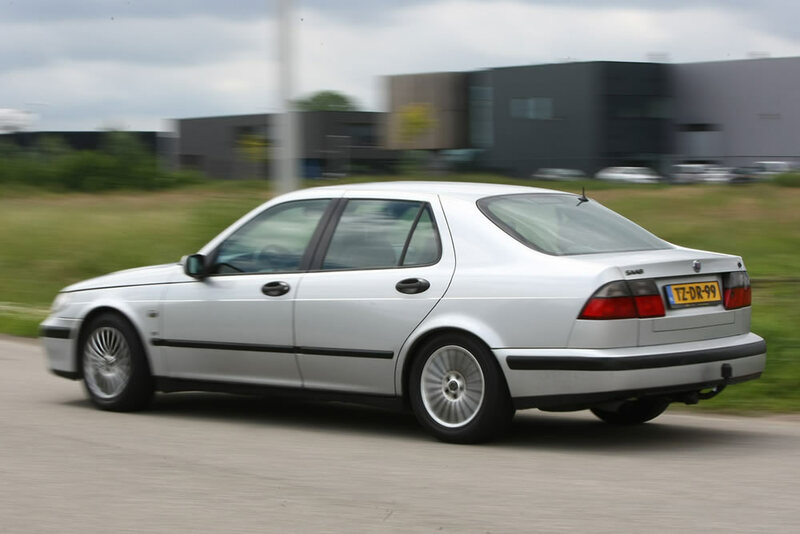 It is used for showing customers how reliable a Saab can be when maintained properly. It still has the original 2.3t 170hp engine and currently 1.136.000 km on the odometer. Thank you for your comment Nic. We always do our best at SaabWorld to ask permission when using pictures from other sites. Occasionally, we do not give the proper credit and it was our mistake with this article. As per our email conversation, the article now shows the proper credits after your approval of using these images. Thanks!